What I tell you three times is true4." And a Broker7, to value their goods. He had wholly forgotten his name15. Such as "Fry me!" or "Fritter16 my wig!" His intimate friends called him "Candle-ends18,"
"His form is ungainly  his intellect small "
No materials were to be had21. He had just one idea  but, that one being "Snark,"
And one Against Damage From Hail26. According to my electronic OED, Lewis Carroll is the sole inventor of this word, with its first recorded appearance in 1876. Since then it has certainly mutated from being used for a creature of indeterminate appearance and great danger to fictional humans. I have often heard it used as if it were a synonym for "snide" though I'm not sure why the words have become tied together, and according to Wikipedia and a few other places in some computer programming communities it was used to designate an unexplained system failure. There are a number of interesting english words starting with sn- that may have helped inspire the original development of "snark". Many germanic words beginning with sn- relate to the nose, and indo-european languages in general have various words derived from roots with a "movable s", in other words, the "s" could appear or disappear without changing the fundamental meaning of the root. If we try dropping the s from snark, we get nark, which according to the trusty OED is an annoying person or thing in new zealand and australian english, or a police informer in british english. Ships or boats of any real size can rarely sail right in to shore for fear of running aground. So it was a common thing for crews and passengers to disembark by using smaller row boats kept on board for that purpose, or even to wade ashore if the distance wasn't too great. In the case of richer passengers, crew members were sometimes directed to carry them ashore on their backs so they needn't get their expensive clothes and shoes wet. Today such practices are basically obsolete since most passenger ships are so large they can use a gangplank or drop down stairs that span the distance between the water and the shore. It seems a bit puzzling just how this could be encouraging to the crew, unless at minimum it's because they have come to a place to stop awhile rather than sail around aimlessly. Mind you, this comes to mind already having read the whole poem. A town crier would have to shout his announcement at least three times in order to firmly differentiate it from random shouting in the street. In addition, the favourite symbolic number in indo-european cultures, three, often turns up as a sort of magical means to mark a statement as true and effective. In the world of Lewis Carroll's books, it is interesting that the White Queen endeavours to believe 6 impossible things before breakfast. I have found at least one web page that refers to this individual as a "bonnets" although Lewis Carroll never does so. It's an understandable reference though, as all other members of the crew are members of professions or else an animal with a name starting with "b". Practically speaking, a bonnet is usually an elaborated version of a hood, that is a hood with additional fabric and decoration added around its edge. In many dialects of english a bonnet is a type of hat only a woman wears, but in a few dialects and snob registers a type of beret with a pompom on top worn by men is also referred to as a bonnet. Lawyers were often divided into two types in the british law system and its derivatives in former british colonies. Solicitors, also called attorneys, could act on behalf of another person, hence the term "power of attorney" for what a person may assign to another because they have lost the capacity to handle their own affairs. They can deal with any legal matter, ranging from criminal to administrative matters. A famous literary solicitor is Jonathan Harker from the novel Dracula, published twenty-one years after this poem. A barrister or advocate spoke on behalf of one of the parties to a law suit, especially in higher level courts. 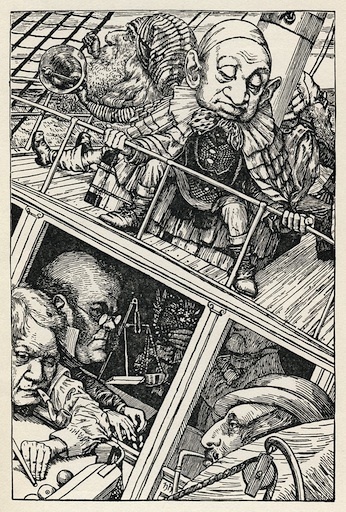 Ship's crews would be prone to arguments, "disputes" when cooped up for long periods at sea, of course. A broker is someone who buys and sells goods on behalf of others, a job that frequently extends to assigning a value to those goods in the first place. In other words, a broker is a salesman. They came to early prominence at the establishment of entities like the east india and hudson's bay companies, for which brokers carried out the sale and purchase of trade goods. Today a significant number of "brokers" are not people but computer programs, especially in stock trading. Take care not to read this designation as "billiard-maker", which would be a very different sort than Carroll is discussing. A billiard-marker is somebody, today more often something that keeps track of the score in billiard games. A dishonest billiard-marker was not unheard of, especially if not all of the players had strong mathematical or reading skills as could often be the case even as late as the victorian era. Currently banks are infamous as the places where people pay to store their money against being stolen and cash their paycheques expecting their pay not to be stolen, but the people entrusted with the money, the bankers, have instead been stealing and losing it in senseless gambling games on the stock market. The end result has been more money for the thieves and economic armageddon for their victims. Alas, the potentially unsavoury character of bankers has clung to them for a long time. The first "banks" were simply tables set up in the marketplaces of asia where foreign traders exchanged their own currency for local coins. Anyone who has had the ill fortune of having to buy currency at a foreign destination knows how badly this sort of exchange is likely to go. Next a banker was someone who ran a table at which board or gambling games was played, so they managed money the players bet on the games, and handed out the cards or otherwise managed turns. The common theme is always being entrusted with amounts of money by a variety of individuals. Beavers have at times been among the most hunted rodents on earth. They were hunted to extinction in much of asia for fur garments, and then in north america once they were found there. Beaver fur was the primary interest of england in north america in fact, because their fur is warm, waterproof, and amenable to combing and compression into shiny fabric used in hats. 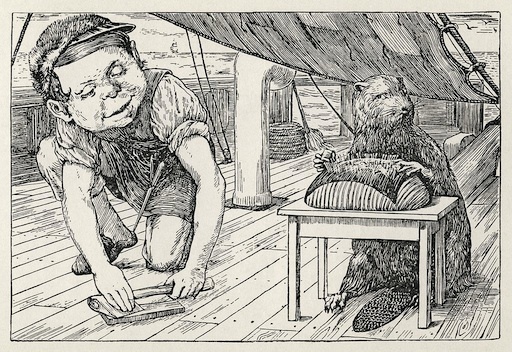 The expression "busy as a beaver" is well known, and since a beaver on a wooden ship could hardly be allowed to do what beavers do in the wild, gnaw down the equivalent of trees to make dams, the Beaver needs something else to engage their attention. Lacemaking is no bad selection, as it requires considerable attention and time to make finer and/or larger lace articles. The Beaver is illustrated making pillow or bobbin lace, where the pattern is marked out with pins. The thread bobbin in the Beaver's hand is the wrong kind, however. The bobbin shown is a sewing machine bobbin; lace bobbins are longer and slender, to facilitate moving them between and around threads. Lacemaking was no trivial matter for certain periods of english history, especially between the 16th and 18th centuries. In that period both men and women of means wore huge, multilayered lace collars, while those less well off might where only one layer of lace in their collar (of course the poorest people had no lace at all). Once the lace was made the hard labour wasn't over. The eventual completed lace collar was made as a separate item from other garments so it could be worn with various outfits, and more importantly so that it could be cleaned and repaired. Cleaning lace collars could be a formidable task. Think of ring around the collar plus food or drink spatters in especially wide collars, and additional debris such as powder or other products applied to the hair or wig, as well as any cosmetics applied to the face. All of this had to be cleaned out, which often couldn't eb done by scrubbing for fear of damaging the lace. So the collars would have to be washed by hand and even boiled, all the while avoiding any action that might stretch or distort them. After that, they had to be ironed and stiffened, and even refolded and stiffened into folds. This meant wielding hot irons heated on a stove or before the fire, and application of starch to produce the rigidity. Avoiding burn and scorch marks would have been its own challenge. Usually it isn't clear how a ship's mascot is helpful to the safety of a ship, and that seems to be part of the point. They are lucky by their presence in a contented state. Animal mascots in particular may be happier relations of the animals carried aboard roman and greek war ships that were sacrificed before going into battle. If the sacrifice gave good omens, the fight was on. 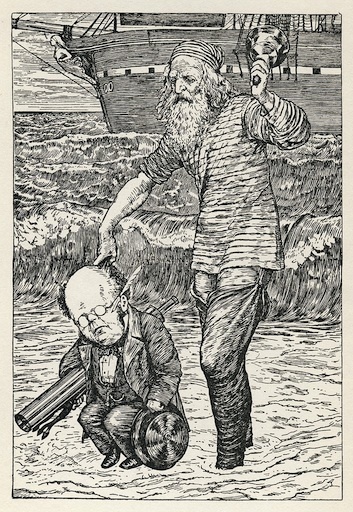 It is sorely tempting to interpret this as a satirical look at Charles Darwin embarking on the Beagle, but Lewis Carroll is writing long after that voyage. The difficulties of travellers on long sea voyages in keeping track of their luggage could be severe, all the more so for impractical or absent-minded scholarly types. This was a major reason for people to have valets or similar types of personal servants if they could afford them, as they could be delegated to make sure nothing was lost or forgotten. Yet another 42 sighting. This would have been close to Carroll's age when Snark was published, but the number had appeared in Alice in Wonderland already. In the context of the poem, Carroll makes considerable use of repetition to create the rhythm and tension in the poem, including repetition of internal items such as numbers and other adjectives. The theme of namelessness as a consequence of forgetfulness is a nearly obsessive theme in Carroll's fiction works between 1856 and 1876. The connection between being named and existing at all is a powerful one, and may have no little influence here on the fact that all of the crew members have names starting with "b" with the subtle accompanying pun on "be." That the Baker has problems remembering his own name foreshadows his fate at the end of the poem. "Fritter" as verb means to waste, and if a speaker is being a bit sarcastic or even quite literal, perhaps to fry. In the context of this poem, the wasting sense is probably the more important. Thingumajig and its cousin thingumabob are nonsense terms used to designate objects for which the speaker can't remember the name. It is both ironic and a little cruel that the crew opt to call the Baker by the word even though he is an animate person, as opposed to the more usual designation of a person of unknown name in informal or hurried circumstances, "whatsisname." In Alice's Adventures in Wonderland, as Alice experiences the effects of the cakes that make her smaller, she worries about "going out all together, like a candle." A candle going out leaves a candle-end, and given the ultimate fate of the Baker, this is quite a sinister way for his friends to address him. "Baker" originally designated a man who made bread and cakes for a living. A woman in the same job was called a baxter, revealing that the original "female" ending in english when one was used at all was -ster. Hence "spinster" and "webster" women who spun and wove respectively. "Bridecake" is better known in canadian english as a wedding cake, and is usually made up of multiple layers of white cake elaborately decorated. People have chosen more creative options since chocolate and the like became available. In fact I have attended a wedding where the groom was a chef who worked out how to spray the wedding cake with hot chocolate to form a shell, and set it up so that he could place a chocolate fountain for dipping strawberries in the middle. It was quite spectacular just for that, but besides the decorations in chocolate icing he added garnishes of chocolate truffles. Thinking back, it's a miracle the table the cake sat on didn't collapse. Should a couple need to have a more budget conscious wedding cake, they may opt to have several faux layers, usually the very top layer and one or two below. The faux layers are styrofoam forms with icing and decorations applied on top. This is quite a reasonable approach, though it is important to warn the person who is delegated to cut the cake, as the couple discovered at another wedding I attended. Food could be anything but pleasant onboard a typical navy or exploration ship. Food preservation was a real challenge, and navy ships especially suffered the additional problem of having food supply contracted out. Contracting out sounds like an excellent way to get the lowest price for whatever good or service is being sought, but in real life typically results in an unrealistically low bid being accepted, which is then achieved by providing shoddy or otherwise insufficient or inappropriate goods. British sailors knew this all too well as they tried to cope with hard tack, an unleavened flour dough biscuit baked rock hard in order to preserve it. These biscuits had to be softened somehow before they could be eaten, and even so when the barrels they were stored in were opened the unhappy opener could find the biscuits riddled with weevils. Practically speaking then sailors would often want or need to eat soup, which could be thin stuff indeed, flavoured with dried vegetables, and if people were very lucky, dried meat. Officers would have whatever fresh food could be acquired, and once canned goods were available, those as well. The Butcher has more than a passing resemblance to the character who usually poses on the front of MAD magazine, and as a close look will reveal, his cap is covered with beaver fur. The hatchet he is sharpening in the illustration wouldn't be useful for a butcher or a hunter who catches beavers, and is an odd illustrative choice. The Butcher has a dagger hanging from his belt, hence the dagger-proof coat recommendation. These were quite feasible long before the age of kevlar, although they were originally much heavier as they were originally made of chain or scale mail. Ironically, kevlar vests need extra help to resist knives and other bladed weapons, so they are quite bulky, in contrast to fine chain mail which is often heavier but less bulky and easier to move in. The most famous Insurance Office being of course, Sotheby's. Life insurance is generally useless to single individuals without dependents unless they expect to leave an estate encumbered with significant debt and die a covered sort of death with a properly verified will on file. At least in canada, a bank is not permitted to sell insurance in the same premises as it sells banking services, apparently due to conflict of interest and the possibility of pressure selling. The propensity of insurance salesmen to try to sell unwanted and unnecessary insurance to people made vulnerable to their sales pitches by fear or recent disaster is proverbial.